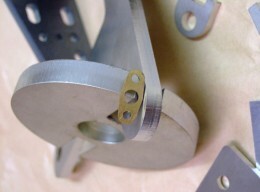 Laser cutting works by focusing the power of a high-power laser onto the surface of the material to be cut. The energy in the laser beam is absorbed into the surface of material, and the energy of the laser is converted into heat, which melts or vaporizes the material. Additionally, gas is focused or blown into the cutting region to expel or blow away the molten metal and vapor from the cutting path. A laser is a device used as an amplifier of electromagnetic radiation. This radiation may or may not have the frequency of visible light. Laser issues a very strong radiation with specific properties. First, the radiation is monochromatic - it is radiation of a single frequency. For visible light, this means that it is single-colored - unlike regular light, which is a mixture of all the colors of the rainbow. Monochromatic radiation is temporally coherent. Another important feature is its spatial coherence, which makes it possible to transmit laser-emitted radiation in the form of thin undispersed beam and focus it into a small point. Laser consists of three basic parts: an energy source, a gain medium and an optical resonator. The energy source is sometimes called a pump or a pump source. Its mission is to "pump" energy into the gain medium so that it can get to the excited state. The source is most often electric, luminary - for example a flash-lamp - or even another laser. Enough energy must be transferred into the medium to reach population inversion - the number of particles in the excited state must be higher than the number of particles in the basic state. A particle gets to the excited state by absorbing enough energy to allow one electron to jump to a higher energy level, which is located farther from the core. When, after some time, the energized electron jumps back, the same amount of energy is radiated in the form of non-coherent radiation. This is called spontaneous emission. The medium is usually stored in an optical resonator that generally consists of two curved mirrors, one of which is partially transparent. Radiation that originated from the spontaneous emission and has the correct wavelength, phase and direction reflects back and forth between them and at each transition it interacts with the medium's excited particles, causing them to return to the basic energy level. When this stimulated return to the original energy level occurs, particles emit photons with the same phase, frequency, polarization and direction as the photons of the passing beam, thus intensifying the desired radiation. Part of the radiation escapes though the partially transparent mirror as a focused laser beam and the other part reflects back for further amplification. According to the type of the gain medium we can distinguish solid state lasers, liquid, gas, plasma and semiconductor lasers. Among the most used in industry are ruby lasers, YAG (yttrium-Aluminum Garnet) lasers or so-called fiber lasers where the gain medium consists of optical fibers.CO2 lasers are the most often used gas lasers. Semiconductor lasers, also called diode lasers, are also widely used. According to time modes of operation we can distinguish continuous and pulse lasers; the latter emit radiation in flashes lasting sometimes only one hundred-millionth of a second. The beam from the source to the working head is usually lead by an optical fiber. Laser's task in industrial applications is to create a radiation beam and bring it to where it is needed, where it can warm up processed material. Depending on the parameters of the process, laser can be used for marking, welding or cutting materials. When cutting, the material melts and evaporates, burns away or it is carried away by the flow of gas. The cut surface is of very high quality. Laser is suitable for cutting of materials to a thickness of 10-15 mm, and in particular mild steel, steel alloys, aluminum and its alloys. The cutting process is highly efficient and accurate, controlled by a computer. Due to the very small beam diameter, the heat affected zone is very small. Laser's disadvantages, when compared to other cut cutting technologies, are its higher price and operational demands.